Azmoodeh-Mishamandani, A., Abdollahpoor, S., Navid, H., Moghaddam Vahed, M. (2014). Evaluation of a Walking Tractor Drawn Peanut Harvester and Comparing It With Manual Harvesting. International Journal of Advanced Biological and Biomedical Research, 2(5), 1390-1397. Afshin Azmoodeh-Mishamandani; Shamsollah Abdollahpoor; Hossein Navid; Mohammad Moghaddam Vahed. "Evaluation of a Walking Tractor Drawn Peanut Harvester and Comparing It With Manual Harvesting". 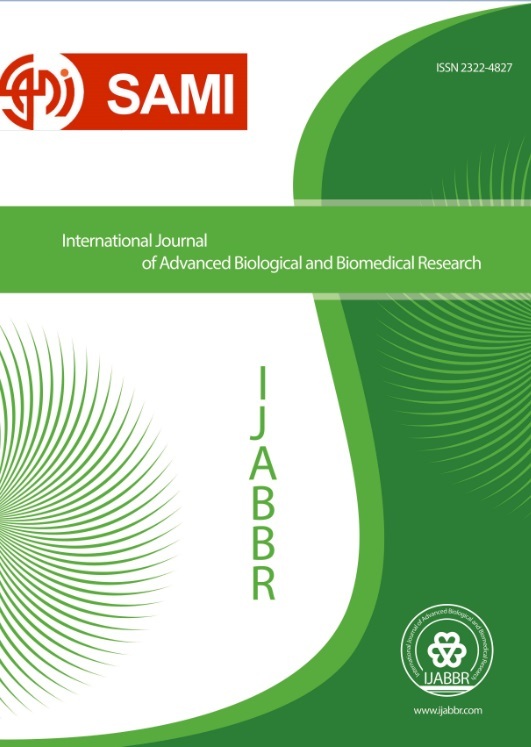 International Journal of Advanced Biological and Biomedical Research, 2, 5, 2014, 1390-1397. Azmoodeh-Mishamandani, A., Abdollahpoor, S., Navid, H., Moghaddam Vahed, M. (2014). 'Evaluation of a Walking Tractor Drawn Peanut Harvester and Comparing It With Manual Harvesting', International Journal of Advanced Biological and Biomedical Research, 2(5), pp. 1390-1397. Azmoodeh-Mishamandani, A., Abdollahpoor, S., Navid, H., Moghaddam Vahed, M. Evaluation of a Walking Tractor Drawn Peanut Harvester and Comparing It With Manual Harvesting. International Journal of Advanced Biological and Biomedical Research, 2014; 2(5): 1390-1397. The object of this study was evaluation of a walking tractor drawn peanut harvester at different conditions of soil moisture content and forward speed and comparing it with manual harvesting. The evaluation factors for peanut harvester were two levels of soil moisture content and three levels of forward speed. The results revealed that the effect of soil moisture content was only significant on the percent of unexposed pods loss, while the effect of forward speed was not significant for all loss. Comparing of harvester loss at best condition with manual harvesting loss revealed that there was significant difference between two methods of peanut harvesting. Manual harvesting loss was higher than mechanical harvesting loss in the percent of exposed and unexposed pods loss. The results of this study revealed that the usage mechanical harvesting instead of manual harvesting reduces harvesting loss, harvesting costs and timeliness costs. Therefore, usage of this harvester instead of manual harvesting entirely recommended.